A five-man panel of LMA Chairman Howard Wilkinson, Sir Alex Ferguson, Joe Royle, Dave Bassett and Barry Fry chose Burnley as winners after back-to-back home victories took Sean Dyche’s side into the Champions League places. Ashley Barnes’ late goal against Stoke – combined with an eighth clean sheet in the league this season – gave the Clarets a fourth home win in five games. Burnley have since moved down to sixth place in the table, but remain level on points with Tottenham Hotspur in fourth spot. Manager Sean Dyche will receive a celebratory bottle of champagne, courtesy of Tanners Wines, and an LG Performance of the Week trophy. It is the fourth time Burnley have won the award for a Premier League performance under Dyche and the second time this season. 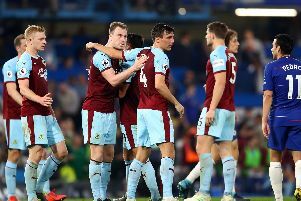 Their opening-day 3-2 win at Chelsea earned the Clarets the prize, as did a 2-0 win at Crystal Palace last April, which all but secured top-flight survival, and a 1-0 home win over reigning champions Manchester City in March, 2015.